The latest rendition of a SportWagen theme. Take a Volkswagen Golf SportWagen, add lift to its ground clearance and imbue this vehicle with all-wheel drive, and what you have is the 2017 Volkswagen Golf Alltrack, a new model. Lifted wagons are nothing new — the Subaru Outback is a fine example of one. Even Volvo has been getting involved, fielding various lifted “Cross Country” vehicles based on existing sedan and wagon models. The 2017 Golf Alltrack is available in three trims — S, SE, and SEL. The Alltrack S with a manual transmission retails for $25,850 and the SE manual starts at $29,430. Add $1,100 for the automatic transmission. The SEL edition ($32,890) rounds out the model line. My test model was the Alltrack S with a DSG. Its lone option was an $845 driver assist package with adaptive cruise control, autonomous emergency braking, and park assist. The total price, including the $820 destination charge was $28,615. 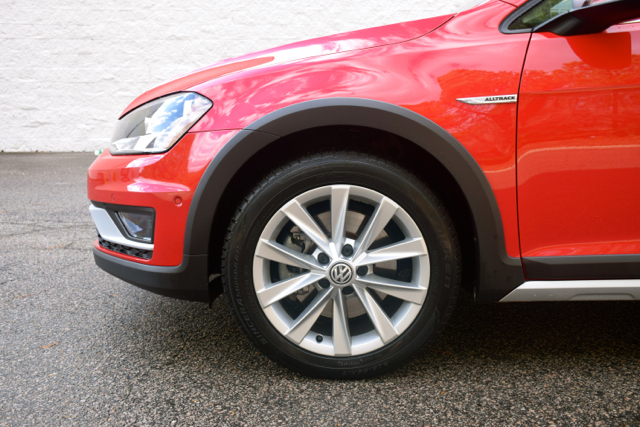 Now that “lift” is only slight — 0.6 inches to be exact, giving the Alltrack a ground clearance of 6.9 inches. On the other hand, the Subaru Outback delivers a ground clearance of 8.7 inches. For further reference, both the Volvo V60 Cross Country and Volkswagen Tiguan 4Motion “lift” come in at 7.9 inches. The Golf Alltrack is a small station wagon as categorized by the EPA. That’s a right descriptor too, as It isn’t quite tall enough to be a crossover. Then again, if you were to call the Subaru Outback a wagon, you’d shouldn’t be criticized for considering it one. The Alltrack may be nearly the same at the Golf SportWagen, but there are some design differences apparent as well. Volkswagen’s trademark narrow upper grille comes in smaller than the lower grille opening, the latter is bedecked with chrome trim. Distinct profile character lines, rocker panel trim, and trimmed wheel arches are present. Every model comes with two-tone side mirrors, 17-or 18-inch alloy wheels, and roof rails. 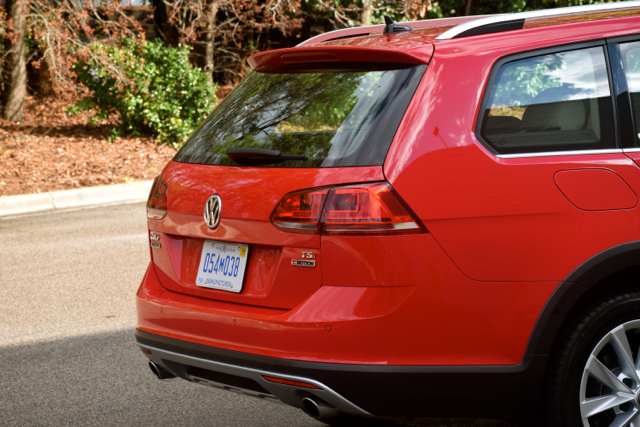 From the rear, the Golf Alltrack has a tailgate spoiler, wraparound combination lamps, and dual exhaust tips. Chrome touches, reflector lights, and a shark antenna are also present. All models are equipped with daytime running lights and front fog lights. Power-adjustable, manually folding heated side mirrors are included. A panoramic tilt and slide sunroof is included with the SE and SEL trims. Bi-Xenon headlights with an adaptive front headlight system is an option on the SEL level only. 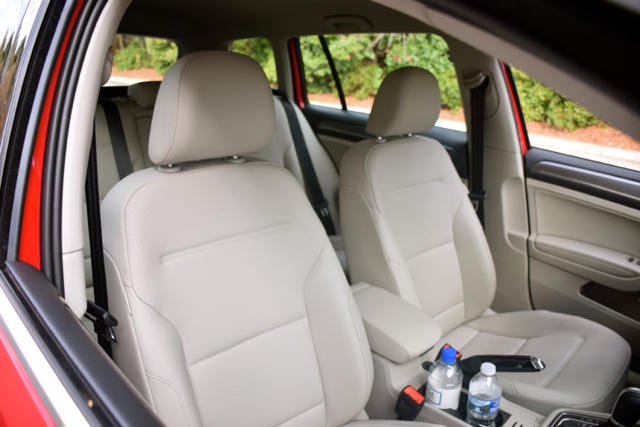 Offering room for five, the Golf Alltrack is dressed in imitation leather seats. 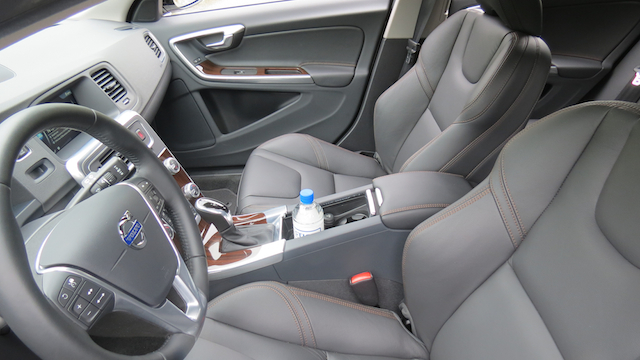 Bucket seats are up front and a 60-40 split-folding bench seat is in the rear. The rear seat comes with a fold down armrest with a pair of cup holders. A pass-through to the cargo area is reached with the armrest dropped. High-quality materials are found inside, including carbon fiber trim. That’s just on the base model. The dash is hard to the touch, but textured, and the center stack is surrounded by glossy material — likely plastic, but having a metallic look. The door pockets are covered in fabric and every other surface shows careful attention to detail —metal pedals are standard too. And with a price tag some $13,000 less than the slightly larger Audi A4 Allroad, the Golf Alltrack is a relative bargain amongst VW Group models. But the Alltrack is seven inches shorter between the wheels than the Audi. Passenger space is tight in the second row, especially legroom. If the driver and front passenger show consideration and adjust their seats accordingly, then legroom is decent. Even so, putting a person in the middle position means sacrificing much, especially with the pronounced drivetrain hump present. The Golf Alltrack comes well equipped with keyless entry, power windows and door locks, cruise control, heated front seats, and standard LED ambient lighting. Also available is push-button start, power front seats with lumbar support, dual-zone climate control, and automatic wipers. Another standout feature for this model is the standard storage space, measuring 30.4 cubic feet behind the second-row seat. Your items back there are kept out of sight thanks to a storage compartment cover. 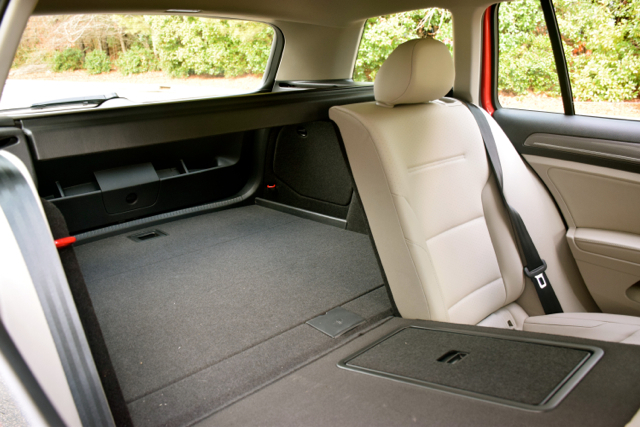 Flip down the rear seat and you’ll enjoy a generous 66.5 cubic feet of storage space — that’s larger than what most small SUVs offer and rivals what the midsize Nissan Murano SUV has. Volkswagen no longer supplies a cable to attach to your cell phone or other devices in an effort to connect. Like all other manufacturers, you now have the expected USB port available. Still, space is tight for making that connection and it usually requires adjusting the transmission shifter to provide ease of access. We can only hope that Volkswagen has a better design coming, preferably with two USB ports instead of just one. To acquire a navigation system you have to choose the SEL model. But there is another option: choose one of the other two trims and rely upon Apple CarPlay and Android Auto connectivity to supply you with directions. Why pay for something that is available as part of VW’s included App-Net system? The Alltrack also provides Bluetooth connectivity, satellite radio, HD radio, and an auxiliary audio port. A 6.5-inch touchscreen is standard across the model line. Choose the base model and your Alltrack comes with a generous eight-speaker audio system. But if you opt for the SE or SEL, you’ll have a Fender premium audio system instead. 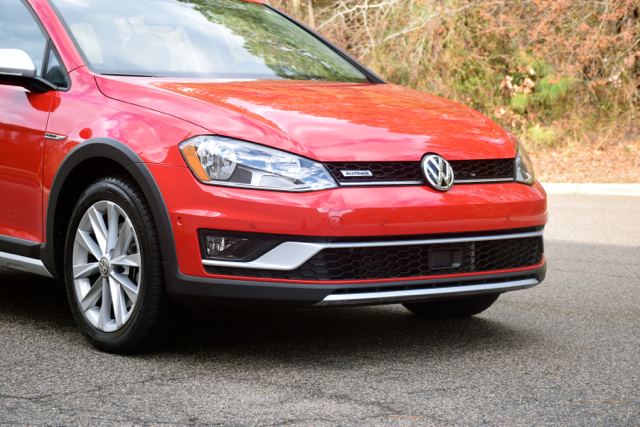 On the safety front, the VW Golf Alltrack received much praise. 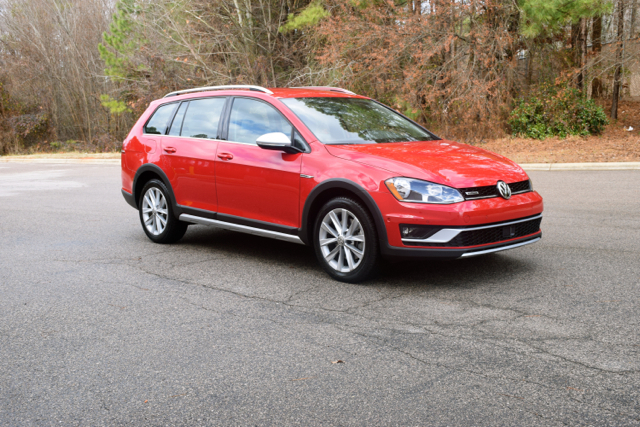 Although the Alltrack hasn’t been tested yet by the National Highway Traffic Safety Administration (NHTSA), the very similar SportWagen has and earned a top five-star crash test rating from this federal agency. The Insurance Institute for Highway Safety (IIHS), representing the nation’s insurance companies, assigned the Alltrack with a Top Safety Pick rating, its second-highest score. The Alltrack notched top grades in all five crashworthiness testing categories: small overlap front, moderate overlap front, side, roof strength, and head restraints & seats. The IIHS also recognized the Alltrack for its available front crash prevention system. The only issue the institute had with the Golf Alltrack was its headlights, finding that it provided poor illumination as do most other new car models. All trims come with a suite of airbags, a tire pressure monitoring system, an automatic post-collision braking system, a rearview camera, and a crash response system. Driver assist features available across all trims include adaptive cruise control, forward collision warning and autonomous emergency braking, and parking assistance, part of an $845 driver assistance package. Only the top-trim SEL adds lane departure warning and high beam control, these features are part of a $1,995 lighting package. Upon its roll out, you’ll find one powertrain combination with the Golf Alltrack. A 1.8-liter, turbocharged four-cylinder gasoline engine making 170 horsepower and 199 pound-feet of torque is paired with a six-speed dual-clutch automatic transmission. A six-speed manual gearbox arrives later in the model year. My week long test time with most any vehicle involves as much as 90 percent highway driving. It is skewed that way as I’m better able to gauge how well a vehicle handles, especially on twisty roads. That highway driving goes beyond state roads and the interstate — two-lane back roads with a speed limit of at least 45 mph are my favorite haunts. My main preference is to drive for miles without passing through a town. Horse and cattle country rock my driving world. First, the powertrain. Here, you have a capable performer with a turbocharged four-cylinder engine. 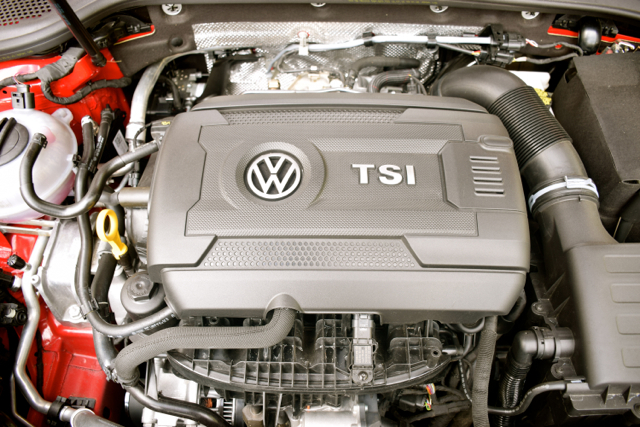 Happily, Volkswagen went with one displacing at 1.8 liters instead of the usual 1.4-liter engine found elsewhere. It provides the necessary punch when you need it and is ideally paired with the dual-clutch transmission. The transmission shifts smoothly and rarely hunts for cogs when traversing rolling roads. Second, I’m an admitted fan of Volkswagen’s 4Motion all-wheel drive system. Just two weeks earlier, a VW Tiguan with 4Motion was my weekly driver. The Tiguan provided me with a first-time sampler of the system, which is a lot like Audi’s famous quattro AWD system. In the Alltrack you also benefit from three drive modes — standard, sport and off-road, with throttle response, steering, and traction and stability control effected. Switch to off-road model and hill descent kicks in. Hang the curves with the Alltrack and you’ll enjoy the taller suspension and modified spring rates. This model stays poised and under control — I learned just how well it does this when I made a 60-mile journey early one rainy morning, plowing through my share of puddles. Not once did the tires slide nor do I feel the steering wheel jerk — the Alltrack imbues confidence whenever road conditions deteriorate. So, Volkswagen is taking aim at the Subaru Outback with the Alltrack. Trouble is, the Outback is one segment up from the Alltrack. Further, the Outback starts at $25,645 and that’s $1,305 less than the VW. For Volkswagen’s credit, the Alltrack’s interior is simply nicer. If the price differential and overall smaller size are detriments to you buying in, then perhaps you’ll consider the Golf SportWagen with 4Motion. With a starting price of $25,750, the cost difference narrows to $105. Certainly, you can’t do anything about the dimensions and you’ll trade away the added height as well as the drive mode selector. The Outback’s performance is better, but the Alltrack beats the smaller Subaru Crosstrek in this same category. What Volkswagen has done with the Golf Alltrack is to shoot an arrow across Subaru’s bow, giving shoppers another model to consider in a very narrow segment. If VW succeeds here, we could very well see the Passat Alltrack, a Eurocentric model not currently destined for the US. Such an expanded approach to the market could rejuvenate Volkswagen and give Subaru serious competition in a niche segment. All photos copyright Auto Trends Magazine. Wagons have not sold well in the United States, but that isn’t stopping Swedish automaker Volvo from introducing a variant to its V60 sport wagon. This lifted wagon comes with skid plates to provide better off-road duty when needed. 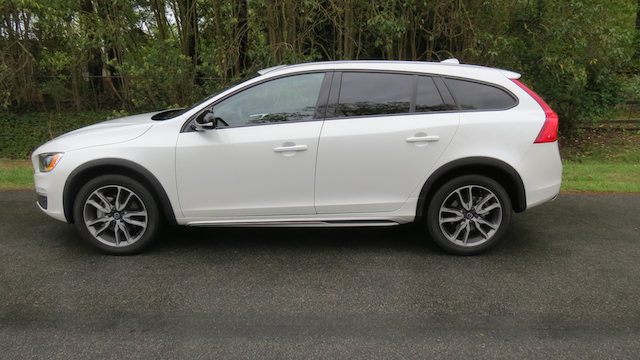 Take a Volvo V60 wagon and put it on steroids and you have a new model. Well, at least something that is marginally different. That’s exactly what Volvo did when it rolled out the Volvo V60 T5 AWD Cross Country for 2015. The V60 Cross Country is the same model as the standard wagon, but with two important distinctions: a higher ground clearance (7.4 inches) and skid plates, the better for assuming off-road duty. Well, maybe not rugged 4×4 work, but at least the light-duty travel on gravel and moderate sloughs you may occasionally traverse. Oh, yes, this model might also serve as a true road beast when the big snows arrive. There is no need to rehash each of the many nuances of the earlier model, what I drove at the beginning of this year. (See — Sportwagon: 2015 Volvo V60 T6 R-Design). The differences in this model are few, but enough to mention here. Unlike the earlier model with its line of four-, five- and six-cylinder engines, the V60 Cross Country comes with only one engine choice — the five cylinder. Even that will change over the coming years as Volvo switches to a complete four-cylinder engine family, with a 2.0-liter supercharged and turbocharged engine powering nearly everything. Yes, the other engines are on the way out as Volvo attempts to maximize efficiencies while severely restricting your choices. The model at hand had the 2.5-liter five-cylinder engine, an oddball of a motor for sure, and a cylinder arrangement used by Volkswagen and previously found in various Audi and GM applications. It is an inline-five and has been serving Volvo and many of its vehicles for the past two decades. The engine is turbocharged and makes 250 horsepower — earlier versions provided performance similar to the six cylinder and fuel efficiency closer to the four cylinder, a winning combination that has served Volvo well. However, with the base engine now rated at 240 horsepower — thanks to a turbocharger and a supercharger as well as an eight-speed engine — the “five” will soon be no more. 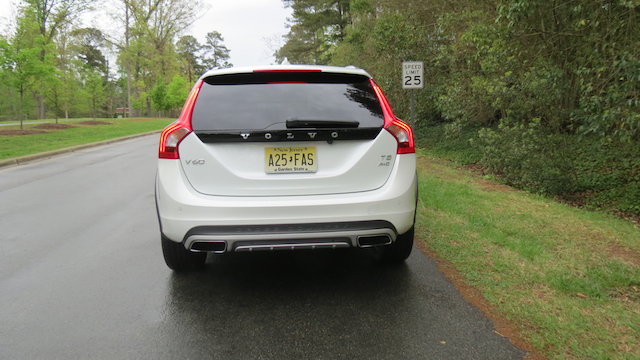 Yet, the V60 Cross Country’s engine gets the job done. Slip behind the wheel of this model, turn on the ignition, engage the transmission and you are off. It has surprisingly decent off-the-mark acceleration with a long power curve. The turbo boost kicks in low at 1,800 rpm and stays at it as you approach highway speeds. Quite frankly, I found the engine capable and quiet — it may be on the way out, but it still has its usefulness. The difficulty in justifying the five cylinder is due to its lackluster fuel economy. This model is EPA-rated at 20 mpg in the city and 28 mpg on the highway or 23 mpg combined. The wagon is considered a compact among premium makes, but it also corresponds in size to more common midsize models such as the Subaru Legacy. The AWD Legacy gets a combined 30 mpg with its 2.5-liter “four,” a number that Volvo is aiming to reach. Certainly, I must admit that I do like the V60 in all of its variations. Indeed, wagon-type vehicles have fallen out of favor in the states, but this one is useful, delivering 43.8 cubic feet of storage capacity. The front seats are very comfortable, the rear seat is too, but your passengers may find the legroom tight. Thus, this model may best be suited for a family with youngsters. There are a few features with the V60 Cross Country that should be noted: WiFi and a voice control navigation system are available. Both features are what premium shoppers want and Volvo has them. WiFi is part of the brand’s Sensus Connect system, what provides connectivity via Bluetooth. Furthermore, you need the optional Volvo on Call service feature, what allows you to connect your smartphone, a laptop or your tablet to the Internet. Even without Volvo on Call you can still use your smartphone to enjoy Sensus Connect via Bluetooth or WiFi. The navigation system does take some getting used to. Without the required passcode (as I experienced) access is thwarted. No worries — vehicle owners are password enabled once they purchase a new Volvo. Of course, Volvo’s best attribute bar none is its stellar safety record. If Volvo could prevent accidents, they would. And they are trying to do just that with an ambitious goal in that by 2020 no driver, occupant or pedestrian will be killed by a new Volvo vehicle. To that end, there is a suite of safety devices that help this model achieve a Top Safety Pick+ rating from the Insurance Institute for Highway Safety (IIHS). Yes, safety is paramount for many people these days and Volvo’s record remains impeccable. 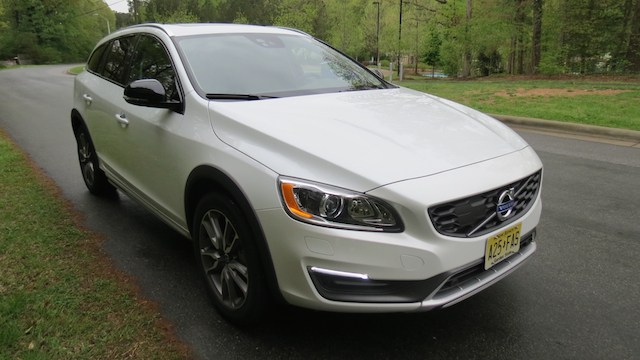 To sum up, the Volvo V60 Cross Country gives you something extra over the standard V60. That standard model is also available in all-wheel drive, but if the added ride height and skid plates appeal to you, then this is your model. Volvo V60 T5 Cross Country photos copyright Auto Trends Magazine.